Each month, Big Brothers Big Sisters of Northeast Wisconsin shines a light on the relationships that we are helping build within our community. 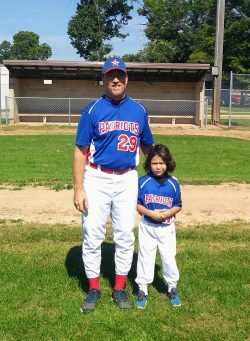 Please help us congratulate Big Brother Patrick Carroll and his Little Brother Derrick of Shawano — our Shawano County Match of the Month for November. Patrick Carroll: A referral. Mark Mailahn. Another Big Brother. PC: I enjoy working with kids and was hoping to provide an ear and some fun to a little brother. Derrick: Because me and my mom don’t do fun things that often. PC: We have done a variety of things. We have gone to Extreme Air, the movies and Green Bay Gamblers hockey. We have also spent time just hanging out. During this time we have played Monopoly, a card game called Garbage (which Derrick taught me) and also some baseball. D: Going to the Star Wars movies. We have been to two of them. “The Last Jedi” and “Solo: A Star Wars Story” . PC: Extreme Air stands out as our most fun outing so far. I also took along 2 of my nieces. We started out with introductions during the trip. Everyone had to state their name, how old they were, what grade they were in and something fun they liked to do. That was interesting as Derrick is a little shy at first as he gets to know others. We got to Extreme Air and did everything they had. We did some tricks on the trampolines. We played some dodge ball. We dunked a few basketballs. We even jumped from a platform into a big air bag. It was an awesome day. Everyone had a blast and we still talk about it. Everyone is waiting for the next time. PC: Camping with my family would be a great experience. We have kids of all ages and Derrick has already met some of them. It is usually for 2 or 3 days and we do many activities such as geocaching, biking, whiffle ball and anything else we find at the campground. D: I would like to go to Noah’s Ark and play in the water all day. Some day, I would like to work there. PC: I enjoy him teaching me new games. I have enjoyed the activities we have done. Derrick is a very active boy. This fits perfectly with me. He always wants to be doing something. I had him help me rotate tires on my vehicle. He operated the air gun and took all the lug nuts off. He is very eager to learn and ready to be hands on. I love that! What is something you learned from your Big? D: I learned how to use an air gun to rotate tires on a car and how to use a saw to build my soap box derby car. PC: Oddly, time is my biggest constraint. I now have to plan more to arrange time to spend with Derrick. It is well worth it as it usually becomes the highlight of my day. What would you say to others who are thinking about becoming a Big about Big Brothers Big Sisters? PC: It is a great experience. Kids are so open and honest. It is a blessing to watch and help them grow. They may also teach you a thing or two. D: It has allowed me to be more active.